The Warrington Wolves brought a seven game winning run to Headingley to take on a Leeds Rhinos side who have struggled to one win in their last three outings. The Champions have struggled so far this season against a fair number of injuries and Coach McDermott has not been able to pick his first choice seventeen so far this season. The Wolves are sitting pretty in third and a win over the Rhinos would put them five points clear of their opponents, who currently reside in fifth. A Leeds win would see them into fourth, maintaining their push on a top four finish. Brett Ferres swapped his bench with Mark Parcell while Josh Walters and Nathaniel Peteru came in for Delaney and Oledzki on the bench. The Wolves brought Matt Cooper into their side after missing the last couple of games. After an end to end opening the Wolves opened the scoring on six minutes when Kevin Brown grounded the ball in goal after a Harvey Livett double dribbe forwards. Bryson Goodwin added the conversion and it was the perfect start for the visitors. Goodwin missed a simple penalty goal on fourteen, hitting the near upright with his kick but two minutes later Livett went from acting half-back close to the Leeds line and made the most of poor Rhinos defence to score. Goodwin was unable to add the extras, the Wolves centre not having a great night with the boot. The Rhinos were struggling to get out of their own half, it was one way traffic. When Warrington were penalised for a late tackle on Richie Mathers the Rhinos took full advantage when Ashton Golding made up for his earlier errors when he took a Myler pass to go through a gap on the angle to score. Kallum Watkins made a real mess of the conversion kick leaving the Rhinos still six adrift. Second before the interval Tyrone Roberts kicked a drop goal to extend the lead to seven but it was testament to the Rhinos defence that despite being totally dominated for the majority of the first half they went into the interval trailing by such a small margin. Just five minutes had elapsed after the restart when Joel Moon span out of two tackles to drop on the line to get the Rhinos second. Watkins added the extras to reduce the gap to a point. The Rhinos hit the front on fifty four, making their total dominance in the second half count, when Ryan Hall was at the end of a right to left passing move to take the Carl Ablett pass and go five metres to dive over in the corner. Watkins converted brilliantly from the touchline and now it was the Rhinos who looked to be in total control. Four minutes later and Ablett scored a twenty metre try after taking a Richie Myler pass and going through a massive gap in the Wolves defence. Watkins added the goal, in off the far upright, for 22-11. On sixty-two a Brown grubber was picked up by Ryan Atkins, somewhat against the run of play, to get the Wolves back into the game. Stefan Ratchford assumed the kicking duties with Goodwin off the field and added the extras. 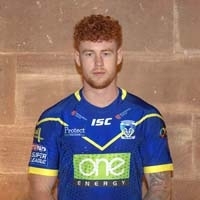 On sixty-eight Livett grabbed his second of the night taking a delightful backdoor offload from Stefan Ratchford and going thirty metres to score. Ratchford added the extras and edged his side back into a one point lead in a see-saw game. Livett completed his hat-trick on seventy-one, at the end of a flowing passing move which started in their own half with a Daryl Clark line bust. Ratchford failed to add the conversion for a 27-22 lead as the Wolves rediscovered their form from the opening twenty-five minutes of the game. Warrington absorbed the Rhinos pressure and took the game when Ben Murdoch-Masila crashed over the line for the winning try with just ninety seconds left on the clock. Ratchford added the extras as the Wolves and their fans celebrated a great comeback victory to make it eight consecutive wis and give themselves some breathing space in the top four. This was a game of four quarters, the first and the last being dominated by the Wolves. The Rhinos did well to fight back and take the lead after being battered early on but rather than let their heads go down when they went behind it was the Wolves who showed the grit and determination to seal a crucial win and signal their intent for the rest of the season. The Rhinos have now lost three from their last four and are starting to lose touch with the all-important top four places. Rhinos: Golding (T), Briscoe, Watkins (3G), Handley, Hall (T), Moon (T), Myler, Cuthbertson, Ferres, Singleton, Jones-Buchanan, Ablett (T), Ward. Subs: Parcell, Walters, Peteru, Mullally. Wolves:Ratchford (3G), Lineham, Goodwin (G), Atkins (T), Charnley, Brown (T), Roberts (DG), Hill, Clark, Cooper, Livett (3T), Hughes, Westwood. Subs:Murdoch-Masila (T), Patton. Akaiola, Philbin.